Our new home is in a diverse, wonderful area of Chicago with a variety of ethnic, chic restaurants. From Mexican and Thai, to Ethiopian and burger joints, our neighborhood boasts some of the most unique food in the city. A few weeks ago, Tony and I decided to try a new Thai restaurant that always seemed to be bustling with people, even during the weeknights. When we arrived we were overwhelmed by over 250 items on the menu, but also the aroma of flavors enticing us to order everything. As we were seated, I noticed other customers slurping up broth from big steaming bowls of pho with thick noodles; you could even smell the green onions they garnished across the top of the soup. Immediately, Tony and I could tell that this place would become our neighborhood favorite. A gem of sorts. Upon glancing at the menu, I noticed that peanuts and chicken were a theme that everyone seemed to enjoy. Noodles with a coconut-peanut sauce, scallions, cilantro and ususally pork or chicken. Of course, anything that resembles peanut butter flavor has my heart. 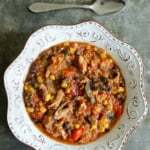 The particular dish was no different, and because I loved it so much, I decided to turn it into a slow cooker meal you could make any time of year right at home. 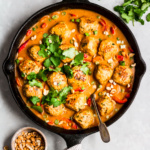 A creamy true peanut butter sauce made with either coconut or almond milk is poured over chicken in the slow cooker to create the ultimate comfort food. Serve over rice and you’ve got yourself a nutritious well-balanced meal. Tony requested that we have this at least 3x a month. That must mean it’s pretty damn good, right? Now you might be wondering what the hell Thai sticky purple rice is. Don’t worry, I’ve got answers! Purple sticky rice is also known as black rice, or sometimes forbidden rice. It’s slightly sweet in flavor, a little sticky and chewy, and absolutely delicious. 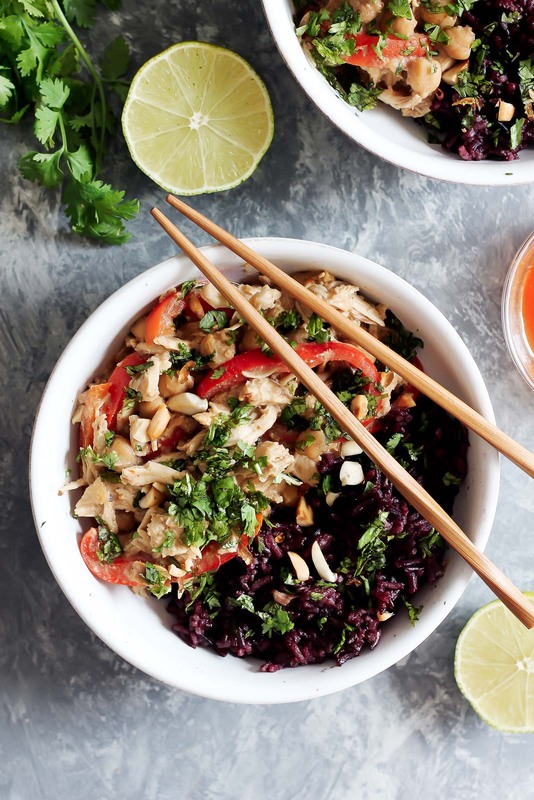 Black or purple rice also boasts one of the best nutritional profiles when it comes to rice; each serving has around 5g protein and it’s lower in carbs than brown rice or white rice! 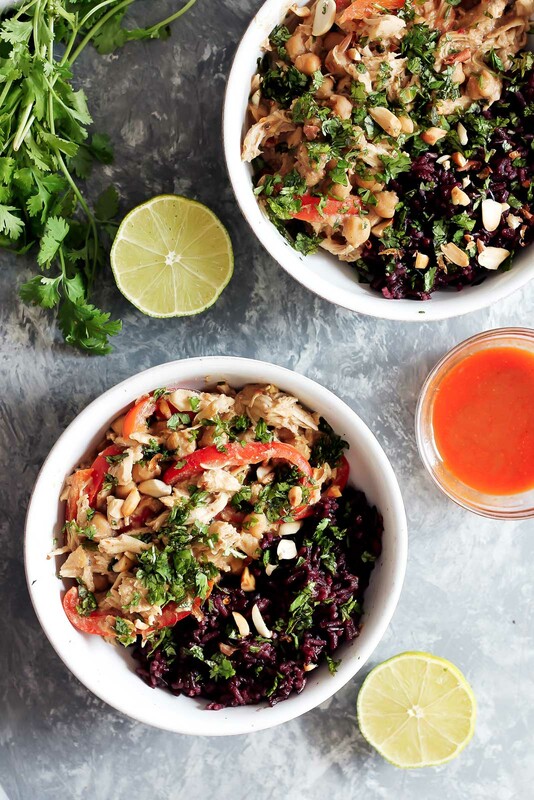 I toasted mine in a little coconut oil to enhance the flavor and it was unbelievable — especially with the thai peanut chicken on top. UM ALSO, I think I forgot to tell you guys that I’m going to Israel next week. Have any of you been?! Tell me everything. I’m hoping to come back with plenty of food ideas for you. If you make this slow cooker thai peanut chicken recipe, be sure to tag #ambitiouskitchen on Instagram! I love seeing your creations! xo. INCREDIBLE slow cooker thai peanut chicken that's tender, savory, full of peanut butter flavor and just slightly spicy (if you like!). Served with any kind of rice you like, although sticky purple rice is my favorite. Add peanut butter, honey, soy sauce, garlic, hot sauce and almond milk to the slow cooker and whisk until sauce is well combined. Add chicken and red pepper slices to slow cooker and spoon sauce over the chicken. Cover and cook on low for 6 hours or high for 2-3 hours. Once done cooking, remove chicken with a slotted spoon, shred with two forks, then return to the slower cooker; stir to combine the shredded chicken with the sauce. About 30 minutes before you are ready to serve the chicken, make the rice: Place a medium pot over medium heat and add in coconut oil and purple sticky rice. Toast rice with the coconut oil for 5 minutes; stirring frequently to toast the rice and infused the coconut oil flavor in. After 5 minutes add in water and bring mixture to a boil, then cover, reduce heat to low and simmer for 25 minutes. (If you are not using thai purple sticky rice, then cooking time may vary. For instance, brown rice takes about 45 minutes.) After rice is done cooking, remove heat, then re-cover and let stand for 5 more minutes. Once done, season with a little salt to taste. To make the bowls, evenly distribute rice and chicken on top. Add hot sauce, peanuts and cilantro on top, if desired. If you are making for meal prep, simply divide into 4 containers (leave off toppings until ready to eat). This recipe can also be doubled if you are making for a crowd. Makes 4 servings. 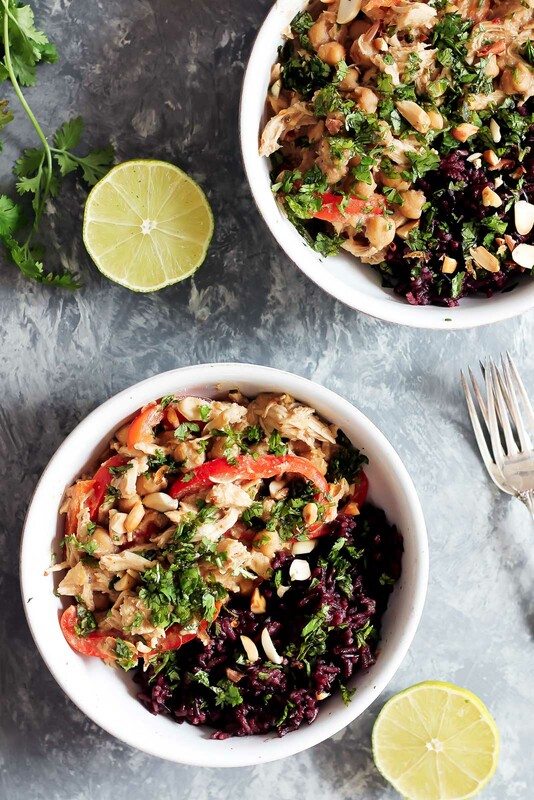 65 Responses to "Meal Prep Idea: Slow Cooker Thai Peanut Chicken with Sticky Coconut Purple Rice"
this looks awesome! i recently moved to mpls and have yet to find really great thai restaurant gem here – making it myself at home is slowly becoming my favorite! adding this recipe to the rotation, for sure. Lemon Grass in Brooklyn Park is the best! My husband is Laotian and gets crabby if he doesn’t get his weekly fix! This recipe looks insanely comforting and delicious! I adore thai food and all the fresh flavors that it offers! I’m a sucker for the chicken and peanut combo! Haha when the boys ask for it over and over again it is a sure winner! I’ve got to try that purple sticky rice, this bowl looks so so good. When did you add the unsweetened almond milk? Sorry about that! You add it with the PB — i’ve updated! Thanks for catching!! I went to Israel on Birthright while I was in college, and it was the most AMAZING experience of my life. You’ll never be able to eat falafel in America again after tasting it in Israel. They do breakfast very different there… every hotel I stayed in, there was CHOCOLATE CAKE at the breakfast buffet. It’s heaven. Have an amazing time and I can’t wait to read about your trip when you return! I need this meal in my life! OMG this looks incredible! I’m drooling over the black rice, how have I never tried it with coconut?! I’m vegetarian so I’ll try subbing chickpeas for the chicken. Israel is incredible! Some of my favorite restaurants are Shila Bar in Tel Aviv and Blue Rooster. Benedict is the best for breakfast! Another little known fact is that Israel has amazing wine! Pelter is a great winery in the North. Also, don’t miss out on Jajo! It’s an underground cave wine bar in Tel Aviv, rated one of the most beautiful interiors in the world. Hope this is helpful. Have a great trip!! This is so brilliant- Thai flavours in the slow cooker! Love the addition of almond milk for a little creamy-yumness. Dat sticky rice though! MAKE THIS FOR ME WHEN I’M IN TOWNNNNN. Im looking forward to making this soon! It looks so delicious! Instead of almond milk usually I would just use regular milk (I don’t usually halve almond milk on hand), but would coconut milk work? Thanks- I love your blog! I made this tonight with light coconut milk instead of almond, and it was delicious. This looks amazing!! I cant wait to make it!! I love love love peanut butter and Thai food is also delicious. Extra points for it being a crockpot meal! Thank you! What could I sub for the almond milk? Reg milk or canned coconut milk? The coconut sounds good to me! Maybe with cilantro on top? Yes you can use canned coconut milk. 🙂 I light the light version, but do whatever you like best. Cilantro on top for sure!!! Can this be doubled and finished in same cooking time? Teenage boys eat a lot and this looks wonderful for a working mom. I made it in my slow cooker with 3x sauce and 4 lbs of chicken – it was divine! My husband has diet restrictions so I subbed in 1 tsp agave syrup for the honey and used 1tsp hot chili oil instead of the sriracha. Everyone loved it -highly recommend! 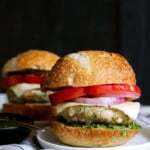 Have you ever made it with frozen chicken breasts and / or coconut milk (tree nut allergy)? I can’t eat peppers could I replace them with onions? Any other suggestions? What size of slow cooker did you use? Do you have a version that uses powdered peanut butter – PB2? I don’t and I wouldn’t recommend PB2, because the peanut flavor won’t be as strong. However if you’d like you can use about 1/2 cup of PB2 and 1/4 cup more almond or coconut milk! Made this last night! Absolutely phenomenal! Can’t wait to try some other recipes of yours! Excited to have you here, Kelli! Will need to substitute Braggs Aminos for soy sauce to make this gluten free. Made this tonight for my parents and we absolutely loved it! Thanks for an easy and delicious meal! 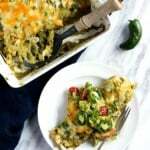 Have you tried making it with additional veggies? How much water do you add when cooking the rice? This was easy and delicious. I used brown rice instead. For me the peppers sort of turned to mush so I plan on adding them later on the next time I make this. Thanks for a great easy recipe! I really like the flavor profile of this dish, but thought that the chicken was a bit too sweet from the honey. That said, my husband loved it and added gobs of extra Sriracha to it. Thanks for introducing us to purple rice as well. We loved the earthiness of it and it complimented this dish nicely. Can i make this vegetarian if i get imitation chicken? Also will it still have to go into the slow cooker ? I’ve made this twice and my husband and I LOVE it!! So yummy and easy! The second time I added some carrots (yay for extra veggies! ), so good! How many cups of water for the rice? Hi Marguerite! The recipe as written should have just the right amount of liquid with about 2 chicken breasts! If I substitute the chicken for chickpeas, lentils or quinoa – what would the cooking time change to? 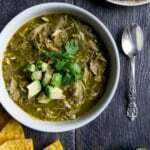 I just made this and adapted it for my Instant Pot instead of a slow cooker – turned out great! Perfect! Such a great dinner to meal-prep. How did you adapt for the instapot? I’d love to try this. This was incredible! 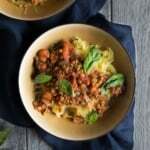 Served into over sweet potato noodles. Thanks for the awesome recipe! Do you think this would work with tofu? Any suggestions on how long to cook it for, and would you keep it as a block or cut it up? Absolutely! Feel free to cube your tofu and then follow the same instructions. 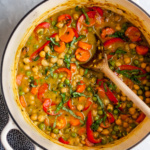 You could also simmer it on the stovetop for about 20 minutes – super easy! I haven’t tried it, but I’m sure you could. This sounds amazing! Any suggestions on how to adapt this for the Instant Pot? Thank you!